Every agency knows the consequences of non-compliance: fines, audits, and potential lawsuits. With social media now playing a pivotal role in the way government agencies interact with the public, creating a learning environment that addresses the needs of the digital age becomes essential in maintaining compliance. 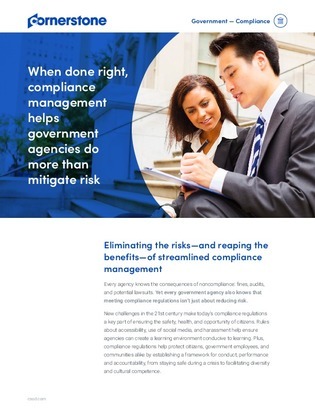 In this white paper, learn how government agencies can help protect citizens, government employees, and communities alike by establishing a compliance management system with the help of a learning platform.